Former Red Sox Manager Terry “Tito” Francona’s book FRANCONA, The Red Sox Years written with Boston Globe columnist Dan Shaughnessy leaves little to the imagination with its insight into the rise and fall of the Boston Red Sox under Francona’s leadership. All of the glory and drama of the 2004 and 2007 championship seasons and the collapse of 2011 are played out within the intrigue of the relationship between Francona, Theo Epstein and the Red Sox ownership trio of John Henry, Tom Werner and Larry Lucchino. Certainly this is a book for Red Sox fans but like Moneyball by Michael Lewis it provides wonderful insight into the inner workings of major league baseball. FRANCONA also offers an inside look at Terry Francona’s personal life, his relationship with his Dad and his struggle with major health issues resulting from injuries during his career as a player. Why did the downfall of the Red Sox occur after the incredible accomplishments of 04 and 07? The narrative makes clear that winning the World Series in 2004 was all about the sport but following the repeat victory in 2007 it became all about the money. The Red Sox franchise at the behest of ownership became money machine in which everything Red Sox was for sale. When the performance on the field faltered in 2008 and 2009 and television ratings on the club owned cable channel began to plummet the financial concerns from the front office further impacted the play on the field. By 2010 fan and media pressure for another championship became so intense that the quick fix was to adopt the New Yankee strategy of throwing money at the problem. The result was the John Lackey, Carl Crawford disaster and the ruination of Francona’s ability to control, the club house ethos. FRANCONA is clearly a thinly veiled rout of the Red Sox top brass with Larry Lucchino receiving the bulk of the wrath. However, there is much in this book that reflects wonderfully on the game and the Boston clubhouse culture established by Francona when he arrived from Philadelphia catapulting the Sox into two World Championships. Clearly, Tito and Dan Shaughnessy leave the impression that Terry Francona is a “players manager” and the perhaps best ever in the most difficult managers spot in all of baseball. It was an impossible position for Bobby Valentine to fill in 2012 and Valentine quickly fell into the trap of making all of the wrong moves with Tito’s boys. Will John Farrell have better luck? As Francona’s former Red Sox pitching coach he has a better understanding of the culture, ownership, fans and the Boston media. 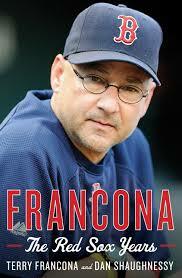 What about Francona in Cleveland? We will see how the “player’s manager” will perform. However, we can guarantee a hero’s reception when the Tito and the Tribe arrive for their first game at Fenway this spring. 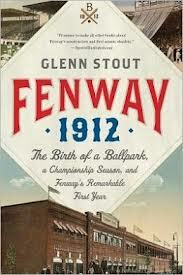 By the way for avid Red Sox and all baseball fans read Glenn Stout’s FENWAY 1912, The Birth of a Ballpark. Baseball in simpler times! Refreshing! You may have caught the news that President George H.W Bush has updated the 1999 compendium All The Best, My Life in Letters and Other Writings. The new volume includes correspondence between father and son during the two terms of the George W. Bush presidency, including poignant comments regarding the war in Iraq and insight into Bush 41’s friendship with former President Clinton. George H.W. Bush has been a life-long writer of letters. I received a personally autographed copy of the original All The Best when the then former president visited his hometown of Greenwich at a breakfast conducted by Just Books, a prominent book store at the time that has since closed. During Bush’s comments it became quickly apparent how emotionally involved he is when referencing his children and grandchildren. He readily admits and it was in evidence that he finds it difficult to read his own personal letters without tears. I became aware of this up-dated version of All The Best while reading Richard Ben Cramer’s What it Takes, a wonderful work of non-fiction regarding the 1988 presidential election and Bush’s victory over Bob Dole and then Michael Dukakis. Cramer credits Bush’s great communications skills as a key ingredient in the Bush victory. Never in the course of that campaign was an opportunity missed to write a personal letter to thank a donor, to accompany a photograph or recognize a favor or personal introduction. That same discipline served Bush during his presidency and over a fifty year career in public life. Letter writing is of course a lost art, replaced by e-mail and text messaging. It seems to me however that neither of the aforementioned leave the indelible impact of a hand-written letter. Letter writing is as inspiring for the author and the recipient. Each of my children, grandchildren, loved ones and personal friends have received a letter upon all of the important occasions, accomplishments and challenges in their lives. I have discovered that despite all of the e-mails, telephone calls and texts, it is these letters that remain in their possession and often rekindle the importance of love, milestones and friendships. They become a landmark in an otherwise sea of words. No surprise that All The Best strikes a chord with me! Thoughts penned by one’s own hand are permanent fingerprints of the mind, ethos and soul. All The Best may define George H.W. Bush better than the thousands of words written about him by others. Dear Britnay,” You never knew your Dad. I didn’t know him either. I had to make the call that sent him into battle.— Your father was one of the ones that made the ultimate sacrifice. He gave his life. I think your Dad felt he might die for he wrote a most beautiful letter to your grandmother, a letter that said among other things, ‘I am frightened by what lays beyond the fog, and yet do not mourn for me. Revel in the life that I have died to give you.’ — I shared this letter with our entire nation during my State of the Union Address on January 31, 1990. As I did I choked up because I knew your entire family was hurting.— I wish I had known your Dad personally. I think I would be a better man if I had known him, for his kind of courage lifts men up and inspires them. May God bless you in your life ahead. 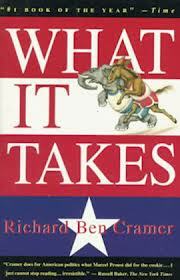 WHAT IT TAKES-RICHARD BEN CRAMER -DOES MUCH CHANGE IN AMERICAN POLITICS ? Pulitzer Prize winning author and journalist Richard Ben Cramer died in January of this year. Cramer is considered by many insiders to have been the best student of American presidential politics. 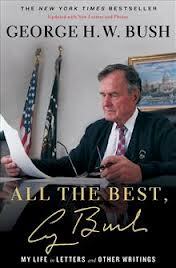 His death brought to my attention the 1992 book What It Takes, The Way To The White House. I can only express regrets for not having devoured this magnificent work sooner. What it Takes, the detailed narrative of the 1988 presidential primary and election, is not for the casual reader. Its 1000-plus pages has been quoted as ” The ultimate insiders book on presidential politics.” Richard Ben Cramer places under a microscope the inner thinking and personalities of those who would place themselves into the 1988 race to become President of the United States. What makes the work even more provocative is the relevancy of the 1988 election, including a bitter Democratic Primary that resembled in great part the divisive Republican Primary of 2012. Cramer details with precision the backgrounds, personalities and political aspirations of George H.W. Bush, Bob Dole, Michael Dukakis, Gary Hart, Richard Gephardt, Joe Biden, Jesse Jackson and the lesser players as well. Of particular contemporary interest is the insight into the mind and ambitions of Joe Biden that may well play out again in the 2016 campaign for the White House. Cramer’s research into the Biden personality is so complete that these pages of What It Takes could well qualify as a Biden biography! More on that to follow. The 1988 Republican primary election is a match up between Vice-President George H.W. Bush and Senator Bob Dole which results in an ultimate November face-off between Bush and Democrat Michael Dukakis. While we think we know Bush better his having had What It Takes to win the presidency in 1988, Cramer’s insight into how the Bush personality and family background made certain that victory is remarkable. Bush had spent a lifetime building friendships, communicating and never burning a bridge. He maintained a big picture view of the oval office. The comparison with Dukakis is stark. The Massachusetts Governor prided himself on being a micro manager and believed right up until election night that the job of the president what that of a manager with the words “leader and vision” rarely in his campaign vocabulary. In many ways What it Takes is a series of biographies. While the book is commendable for this reason alone, don’t look for neat compartmentalized chapters on each personality. Cramer’s prose and story telling is much more sophisticated. The reader will learn why Bob Dole, the “Bobster” became the “Hatchet Man,” why Gary Hart’s personality demanded that even after withdrawing over the Donna Rice scandal, he re-entered the race in denial that he had no chance. Joe Biden withdrew over a plagiarism scandal and re-entered the campaign only to be sidelined a second time by a nearly fatal aneurism. Richard Gephardt worked harder than any Democratic candidate but failed to find a message. There is Kitty Dukakis, Barbara Bush, Jill Biden, Lee Hart, Lee Gephardt and of course Elizabeth Dole. Along with all of the candidates the “press” and of course the handlers, consultants and political advisors have a constant presence in the narrative bringing out the often shameless positions that candidates take to win elections. Paraphrasing Cramer, the presidential election process ” cheapens the issues or ignores them, reduces the dialogue to noise, is spendthrift, exhausting and hurtful.” Cramer leaves no doubt the attaining the presidency is a brutal obsession and leaving little left of individuality. Winning the presidency and moving into the bubble changes very little. A most memorable reference from What it Takes concerns the first Gulf War, Desert Storm. How did President Bush manage to put together the coalition to force Saddam Hussein out of Kuwait? “He was the only man alive who had personal friends as the heads of states in 30 countries. ” He called in the favors. My takeaway is that George H.W. Bush was the only candidate in 1988 who understood in totality what was required to be elected president and who was willing to make the sacrifices to attain the goal. He had learned that from a life-time in public service and from his family’s heritage. Ironically, four years later Bush 41 may not have had the willingness to repeat the same sacrifices necessary to defeat Bill Clinton in 1992. Yet, after the fray, they became good friends. What it Takes is a big commitment of time but if you love the American political system and wish to gain a rare biographical insight into the minds of the players in 1988 your investment will be rewarding. Like all good historical research and writing the knowledge gained is relevent in the present. Listen to what Bob Dole said at a convention of Young Republicans in Seattle in 1988. ” Conservative does not mean callous. I’d like to see fifty wheelchairs in this audience, fifty black faces, fifty Hispanics, fifty Asian Americans. We have a responsibility to open up the doors of this party.” Did anyone in the 2012 GOP inner circle hear the Bobster or were his words simply lost in the cacophony of just another campaign?